As a mother, I know the importance of being organised and keeping things simple. One area I've always felt could do with some simplification is the nappy bag... making sure that it's always stocked with fresh nappies, a clean changing mat, wipes that haven't dried out, all this while trying to keep it as small and light as possible is a challenge at the best of times, let alone when you're in a rush or have tasked your in-laws with taking baby out for a stroll. That's how the idea of the Complete Nappy Change Kit was born. A kit as light as possible with all you need to change baby on the go. A simple solution to make all parents' lives just that little bit simpler! "Fantastic nappy packs, so easy to pop one in my bag on the way out, especially if you're in a rush!! Everything you need, two nappies, wipes, change mat and bin bag. Absolutely love how convenient they are. Will definitely continue to use." Choose from three practical kits. there's never a moment where you won't have everything you need to get your little one nice and clean. Save 10% when you buy a pack of 10, save 20% when you buy a pack of 20. FREE shipping Australia wide for orders over $30. In a rush, no time to pack your nappy bag, simply grab the complete nappy change kit. All you need to change your baby in one kit. Baby-sitters, grand-parents, friends, everyone can take baby on a stroll without the risk of having forgotten an essential item to change baby. Always there in an emergency. Keep one in your car, in the stroller and in each of your hand bags! Say goodbye to your heavy nappy bag, the Complete Nappy Change Kit is all you need and only weighs 130g! 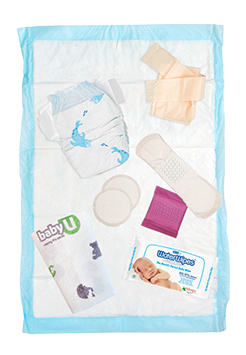 With the disposable mat included, you can change baby anywhere and dispose of your dirty nappy in the disposable bag. Packaged with love in Australia by The Apple of your Eye. Proud supporter of team Metrics at the F1 in Schools™ Technology Challenge. Distributed by Pacificare, a division of Cosimer Pty Ltd.
© 2018 COSIMER PTY LTD. All Rights Reserved.